Alamos Sonora Mexico » Sadnah, Chivo, San & T.J.
Sadnah, Chivo, San & T.J.
Thursday night in Barrio Las Higueras, at Sadnah's home, is drum night. Every inch of Sadnah’s casa was textured, patterned, colored, imaged and emotionalized. Her paintings were everywhere as were her drums. Barrio Las Higueras – The Trees, was on the southern side of Arroyo Agua Escondida. Sadnah’s casa was on the personal side of human expression, a ride into something ruled by the creative spirit, itself driven by a love of humanity. Call it a hippie house if you wish, but it is “hippie” in the best sense of the word and world – Sadnah was more a creator than a consumer. 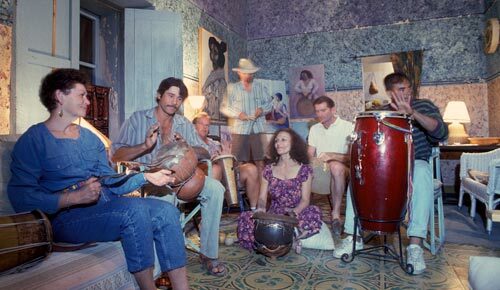 These drum sessions were spirited and brought folks together from different elements in search of the universal one-and-two-and… much like Alamos itself. Many of the drums at Sadnah's were made by Eusevio Cortez. 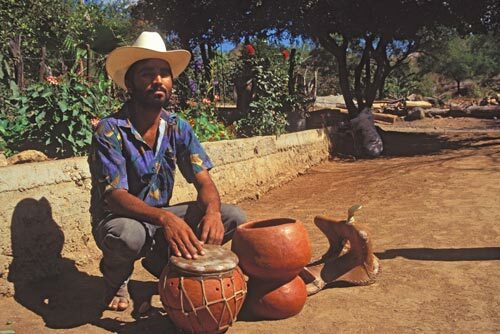 I met “Chivo”, Eusevio Cortez, near the cemetery in Barrio La Compana on a bright Spring mid-morning to photograph him with a couple of his handmade drums. “Chivo” was highly respected by Sadnah, they were part of the same set of intersecting social groups. Being a drummer myself, one in a hundred people are, I respected what he was producing, the craftsmanship was excellent and the resulting tone strong and true. We were in the northwest corner of La Compana which is higher up a slope from the arroyo. It was as if I was in another land from where I awoke on Calle Comercio. Alamos Centro has an international – Spanish vibe. La Compana was Mexico. An Alamos experience is defined by where one is staying, who they are visiting, who they are related to and the activities-interests they are pursuing. Serendipity occurs if the spirit is willing and if one wants to shut out the outside world they can, it is their call. One barrio is a world separated by arroyos, roads, and hills from other barrios, they are little villages. San Sanchez looks up to the mountain he loves, hikes and paints. San could reach the top of Mt. Alamos faster than anyone else who accompanied me to the highest of high grounds. He flew across the trails, along with his dog, with the grace of the colorful parrots he admired and painted. It was a thrill to see this majestic birds flying across the canyons, a daring red flash of movement with bright rainbows of shimmering accents that caught any eye’s attention. San lived with his girlfriend Karen in La Compana, lower and closer to the arroyo and cemetery than where I had met Eusevio Cortez earlier in the day. San was living the Mexican existence, life was hard, one had to maximize all available resources and waste none in a modest home with a couple of rooms in a neighborhood of working class casas. When I visited he was working on a panoramic detailed painting of being atop of Mt. Alamos looking southwest. It was a view that few have seen and there, of course, he had his beloved parrots flying. San and Karen were also getting ready for a band practice with their bass player, T.J. Cook. T.J. had a long walk to La Compana from the other end of town west of the airport. This was serious business. They had a booked a gig to play at a gringo party. San showed me their playlist of ambitious and challenging tunes. It was if they were getting ready to play at Carnegie Hall and they wanted to let the world know they were at the top of their game. The heat of a late Spring mid-day hit me in the face as I left their darken house, dark to protect and preserve every bit of cool they could, on many levels. This is a look at life in the Álamos plaza between 1993 and 1996. Much has changed since then but much continues as it has for hundreds of years. 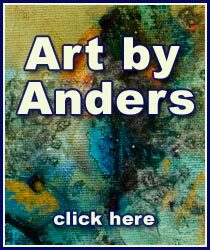 Photos and video editing by Anders Tomlinson. Music, “Mystic Hoedown,” is by the Dirt Brothers/SonicAtomics featuring Denver Clay and Anders. 2015 Anders Tomlinson and Denver Clay, all rights reserved. Mangos, papayas, bananas, palms, amapas, orchidias and other trees provide food and shelter for native and migrating birds. 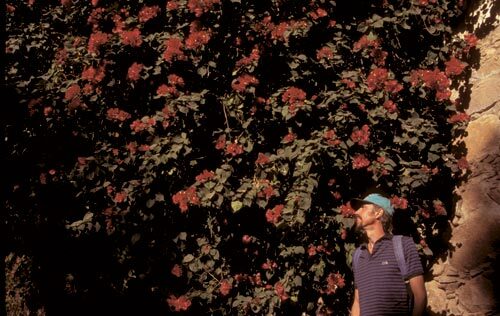 Cascades of colors come from flowering vines: blue veracruzana, orange trumpet, red, magenta and orange bougainvilla and… And the smells and scents that envelope one’s senses… Formal, informal… it all contributes to this symphony and riot that is the passing seasons in Álamos, Sonora, Mexico. Estudiantina de Álamos performs before a packed Plaza as a film crew captures the event. It is a big day in the Plaza. A TV crew has come to town and is filming a music concert. Estudiantina de Alamos, a crowd favorite, is performing. They will also back up several other acts. The bandstand is surrounded by adolescent girls and scattered smiling mothers. This page took 0.343 seconds of computer labor to produce.